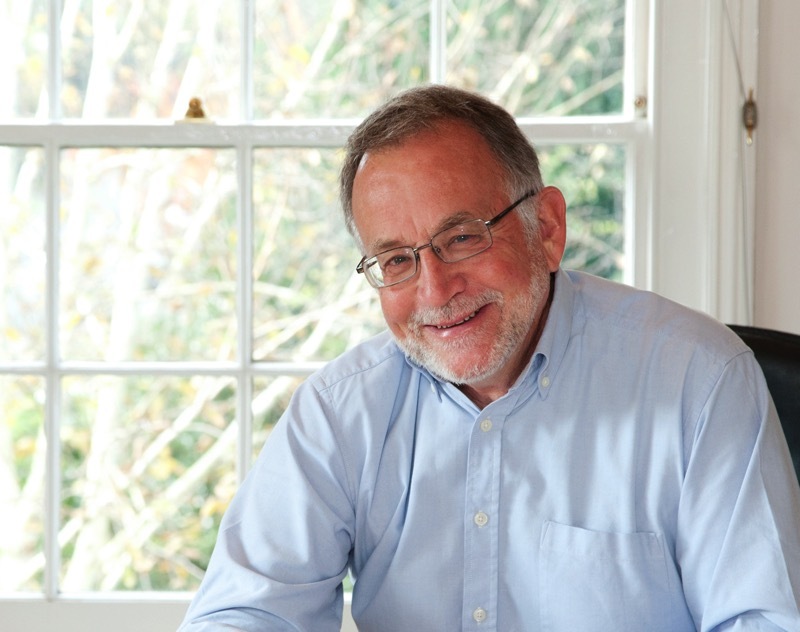 The Trustees of World Heritage UK are delighted to introduce Chris Blandford as its first President. Chris has over 40 years of professional experience within the heritage sector, both as a company director and as a consultant, and is widely known and respected in the UK and overseas. Formed in late 2015, World Heritage UK was set up to represent the collective views, opinions and aspirations of the UK’s 30 World Heritage Sites, and provide a platform for networking, advocacy and promotion. With nearly all of the UK’s mainland Sites now full members, some strong advocacy and two national conferences having been staged, this is a perfect time to move up a gear, and Chris is superbly placed to help the organisation do that. Our World Heritage is under significant pressure, with Sites needing to cope with the fast-moving change of modern development, challenges from funding restrictions and climatic change. The UK is a world leader in heritage management and WH:UK provides essential support to those charged with the responsibility for our heritage management. Chris’s passion for natural and cultural heritage has enabled him to be a significant contributor to the nomination, management planning, and masterplanning of over 25 World Heritage Sites and Candidates in both the UK and overseas. Dr Sam Rose, Chair of World Heritage UK goes on to say, ”this is great news for WH:UK and more importantly for our membership – those organisations who look after the country’s finest heritage. Chris’ business leadership experience, professional profile together with his innovative and interdisciplinary way of working makes him well suited to assist in the challenges ahead and future development of WH:UK, and we look forward to him getting fully involved”. World Heritage Day Thunderclap update: if you have a Twitter or Facebook account, we still need your help! “World Heritage Day! Join us in celebrating the UK’s 30 World Heritage Sites using #WHDay2017“. Thank you so much to everyone who has signed up so far – we’re nearly there and the total reach is over 538,000, which is amazing!! but we still need some more supporters to make it happen (we need a minimum of 100 for it to start). If you haven’t yet signed up you can do so using this link: https://www.thunderclap.it/projects/54955-world-heritage-day-2017. If you have done already we would still love it if you can continue to spread the word to your team’s/volunteers/communities. Remember that you can sign up on more than one platform – so if you have already supported with twitter you can also support with Facebook and Tumbler. They all count! In March 2017, WH:UK Vice-Chair Tony Crouch was invited on a ‘high-level’ British Council delegation to China. Here is his report. The rapid urbanisation of China and the sheer size of the country marks it as one of the most fascinating societies in the world today. In the past 40 years, the number of people who have migrated from the Chinese countryside to cities is twice the population of the USA. Global recognition of China’s cultural heritage has seen a similar growth and after ratifying the World Heritage Convention in late 1985, China now has 50 inscribed sites and is hot on the heels of world leader Italy with 51. The purpose of our week-long visit was to encourage cultural heritage collaboration between the UK and China. This was inspired by China’s 13th Five Year Plan which includes cultural heritage protection as a priority and at the same time in the UK the Department for Culture, Media and Sport are encouraging the heritage sector to explore international opportunities to showcase our world class heritage protection expertise. My colleagues on the delegation were Alexandra Warr (Senior Advisor, Historic England), Debbie Dance (Director, Oxford Preservation Trust), Alison Richmond (Chief Executive, Institute of Conservation) and Humphrey Welfare (Chairman, Hadrian’s Wall World Heritage Site Partnership Board and Trustee of the Churches Conservation Trust). We were expertly organised by the super-efficient Katherine Peringer from the British Council. It’s a twelve hour flight from London to Beijing. Having taken-off at 4:30pm, by midnight UK time the eastern sunrise was already appearing through the aeroplane windows, so we effectively skipped a night and confused the body–clock. Landing in Beijing, the long, cold, dry winter had turned any grass a parched sandy-brown colour and cars and building windows were covered in a film of dust reminiscent of high-pressure English summer weather conditions. The city traffic was heavy and the air was thick. Our first visit was to the Forbidden City, the imperial palace off Tiananmen Square, in use from the Ming dynasty to the end of the Qing dynasty (1420-1912). 16 million annual visitors now make this the world’s most visited museum. (The British Museum, ranked 3rd, has 6.8m). These visitor numbers for the Forbidden City have jumped from 7.5m in 2015 and demonstrate the astronomical rise in Chinese domestic tourism. We visited at the end of the day and had the privilege to take crowd free photographs, but if there is one area where our Chinese colleagues undoubtedly have greater experience it is in dealing with huge visitor numbers. 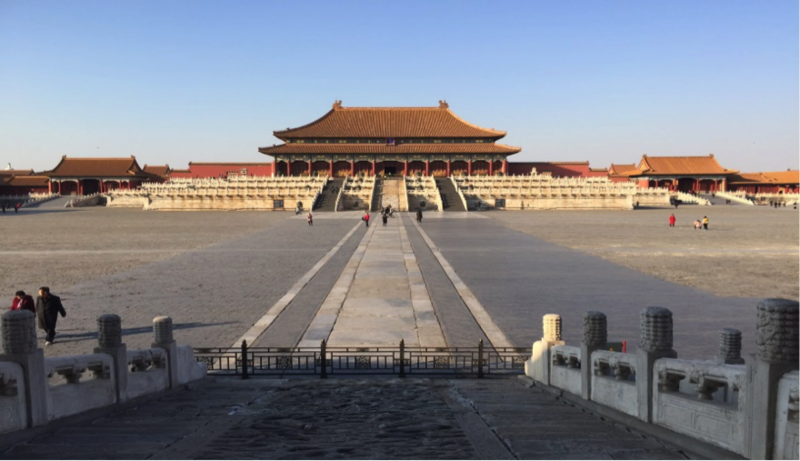 Access to all areas in the Forbidden City seems good, so it will be an on-going challenge for managers to prevent erosion of surfaces and other issues associated with such immense footfall. The Forbidden City, Beijing. A rare tourist free photo of what is now the most visited museum in the world. The following day, our second visit was a 1 hour 20 minute drive north-west out of the city to the Great Wall at Badaling Pass. This is the most popular section of the 13,170.69 mile (21,196.18 km) long wall to visit. The wall was constructed over a 2,000 year period, with the Badaling section constructed circa 1505 (Ming dynasty). The wall divided the Chinese farmers to the south from the raiding nomadic Mongols of the north. The invention of firearms later decisively tipped the balance in favour of the defending Chinese. We met the director of the Badaling Wall in a room which had previously received over 500 state leaders. Since this 3km section of wall was opened to the public in 1958, a 30 year conservation and restoration period ensued, funded by central and local government. Over 200 million people have since visited this section and un-surprisingly conservation and administration are now wholly supported by admission fees (40 RMB = £4.69 per adult). Pre-1990’s 30% of visitors were from overseas, but that number has since fallen to 10% with overall numbers rocketing to 8 million a year now. As of 3 years ago, ticketing measures cap maximum numbers on the 10-20 days per year when numbers can reach 100,000 per day. Modern facilities here have been sensitively located, with the large car and coach parks discreetly positioned. There are gift shops and cafes, but fewer than expected as under Chinese government regulations the museums are not permitted to financially profit from these. Visitors are encouraged to these managed sections, with ‘wild’ stretches of the wall closed to the public and trespass is illegal because of the safety risks to visitor and the uncontrolled impact upon the monument. 13m RMB has recently been invested in a new ‘monitoring centre’ which we were shown. This includes a scale model of the wall and a bank of monitors from the 296 cameras which cover the 3km section. Cameras are prevalent in China but in all the conversations I have had with Chinese nationals nobody has expressed this as a problem and they focus on the safety of such surveillance. This was the first of several occasions where we saw a very ‘hi-tech’ approach to monitoring of cultural monuments. 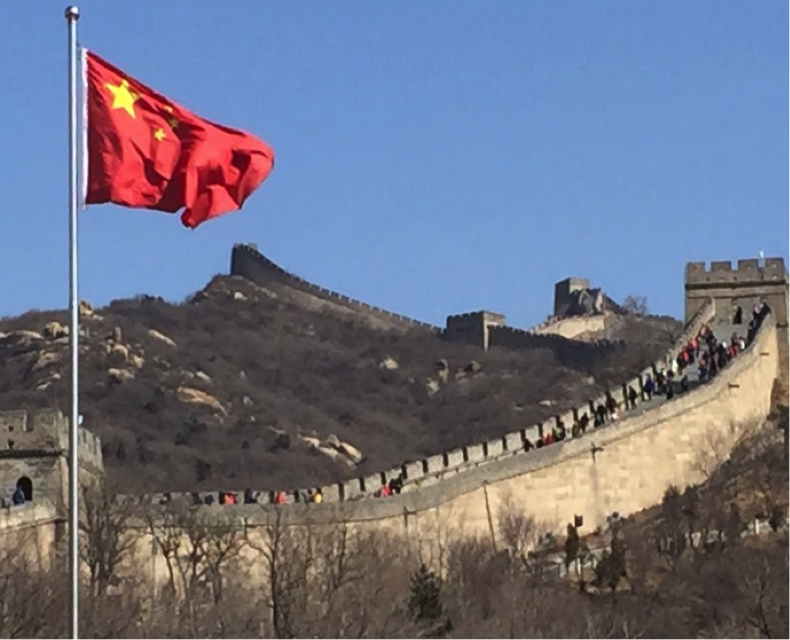 The restored wall at Badaling offers iconic views and is in a good condition. Perhaps of more interest to us as conservation professionals was a visit to an unrestored section, showing a rammed earth bank with a derelict brick lining to it, overgrown by grass. Humphry (as an archaeologist and Hadrian’s Wall expert) was in his element here, spotting construction similarities with the Roman defences. 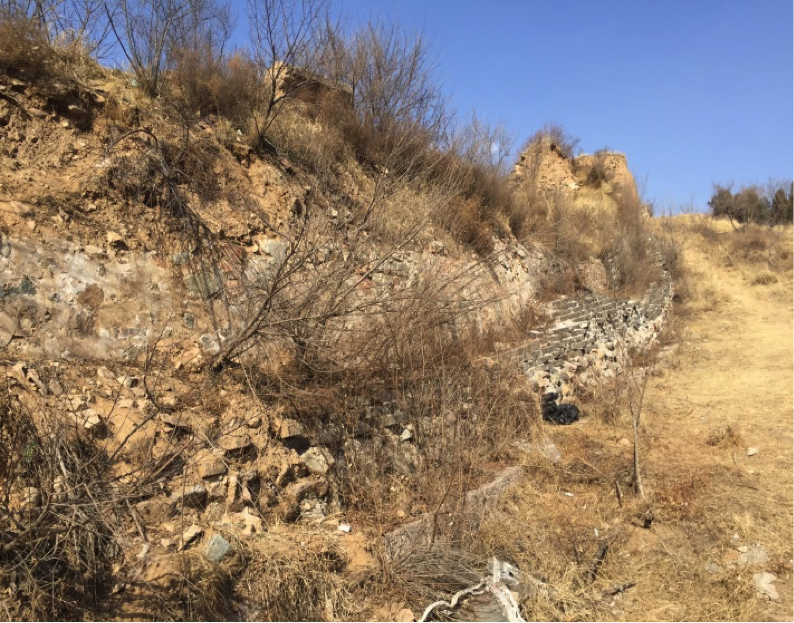 The less well-known image of the wall in a pre-restored state, close to Badaling. Tuesday was our ‘conference’ day at Peking University. The university has a delightfully landscaped campus of lakes and trees, providing an oasis of calm in the big city with the peace shattered only by the boisterous Azure-winged Magpies. The UK and Chinese experts ran through a series of presentations followed by an in-depth question and answer session. In academic terms, there seemed little to separate the conservation philosophies of the two countries. The archaeologists found much common ground over areas such as re-burying artefacts to aid their preservation. The conservators also found few differences, with the Chinese particularly strong in applying new technology. If there was one thing missing it was discussion over conservation of historic urban areas. I suspect that conservation of ‘ordinary’ historic domestic housing has been a casualty of mass urbanisation, but with a need to house a population of 1.386 billion people China will inevitably have had to make practical choices. There were also unexpected similarities between our approaches; with for example the use of volunteers in Chinese heritage protection demonstrated as was an increasing level of community involvement. One action which the British Council, Historic England and WH:UK took away was to produce a quick guide to the conservation bodies in the UK and China. The range of government departments and ‘NGO’s’ in the respective countries can be bewildering and mapping these out would be useful. Other messages (opportunities?) of relevance to WH:UK were that China appears to have a conservation skill shortage in areas such as intangible heritage and a real desire to collaborate in training on aspects such as industrial heritage. On Tuesday evening we attended a reception at the British Embassy in Beijing. It was my first visit inside an overseas embassy and a fascinating insight into how things work. We were warmly welcomed by the Ambassador, Dame Barbara Woodward, who is the first female UK ambassador to China. Amongst the guests present was British Museum Director, Dr Hartwig Fischer, in Beijing to open the touring ‘A History of the World in 100 Objects’ exhibition. On Wednesday we left Beijing to fly (2:15 hours) south-west to the city of Xi’an, in Shaanxi province. This province was the home of many emperors and is rich in cultural relics. 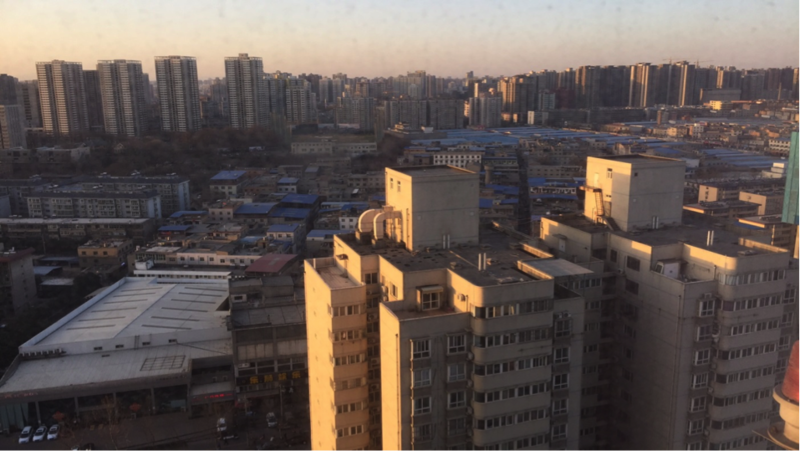 Xi’an is again a big city housing 8.76 million and the journey from the airport to the centre passed by many suburbs clustered with new residential tower blocks. Our centrally located hotel was also high-rise, with our rooms on the 24th floor being nowhere near the top. Modern urban China. A view over central Xi’an, showing the high density urban planning and the ubiquitous residential tower blocks. East of Xi’an (a 40 minute drive) is the site of the Terracotta Warriors (inscribed in 1987 under the less memorable title ‘Mausoleum of the First Qin Emperor ‘). The first remains were found by farmers digging a well in the early 1970’s on non-descript grassland and what they found turned out to be one of the most outstanding archaeological discoveries of the century. Nearly 8,000 full scale models of an army are located in a series of pits, aligned in authentic battle formation and facing east to protect the Emperor’s tomb from attack from that direction. The figures include archers, horses and infantrymen and show a remarkable level of individual detail. They were contained in a pit, covered over with a wooden beamed roof, and then buried. The roof has since collapsed but it served well to protect the archaeology. The warriors are displayed in situ on a 2km square site covered by several vast aircraft hangar type buildings. I didn’t know what to expect but the initial entry into the building and the sheer size of the collection spread before you is truly breath-taking. There are also many museum cases showing the more intricate pieces and the story of the excavations, so the level of interpretation is high. The income from admission fees has enabled expansion of the site and this is an attraction where the visitor can easily spend half a day or more. The UNESCO symbol is proudly and prominently incorporated into the building in a very innovative way (see the photo at the start of this report). The warriors are a small part of a much larger network of 190 funerary monuments and objects from these are housed in the Shaanxi Museum. There are two outstanding ‘must see’ collections here. The first is a buried hoard, consisting of a pair of urns, each containing jewellery, coin and decorative items of exquisite craftsmanship. What is of equal interest to the contents is the mystery surrounding the hoard. Hoards are usually buried hurriedly at times of conflict, but here each urn was so carefully packed that curators struggled to re-pack them and the inside of the lids carry a detailed inventory of the contents. The burial was close to the imperial palace and one of the 3 main suspects is the Emperor’s treasurer who unsuccessfully tried to flee the palace during a revolt, was prevented from doing so, unwisely joined the revolt and was executed once the Emperor regained power. Sometime in the middle of this did he find time for some careful packing and digging? 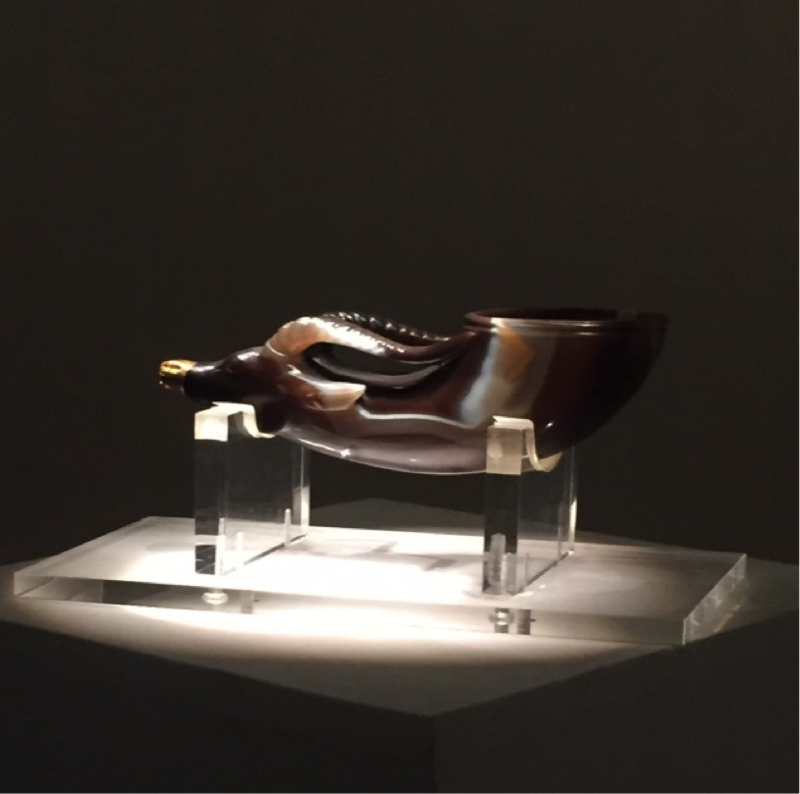 The Agate Cup from the hoard, in the shape of an Ox with a gold mounted mouth. The second outstanding collection is of wall paintings from the numerous surrounding imperial tombs. Once the underground tombs are opened the process of decay can be rapid and many paintings have been carefully removed (together with the top layer of plaster) and conserved. These provide a remarkable insight into the everyday life of the royal court. They show a highly sophisticated multi-cultural society and differ from western funerary art in that they do not portray death or religious messages connected with it. Instead they show smiling figures happily engaged in every day past-times and a range of wild creatures including the ever-present dragons. Every other wild creature depicted is known to us today apart from the dragon. Why has this mythical creature found such a stronghold in folklore? Was there ever such a creature?! The Shaanxi cultural heritage and Great Wall) provide much for the Chinese people to take national pride in. In the UK we view much of our ancient history, such as the Roman period, as belonging to that of another culture or invading force. In China there seems to be a more direct ancestral connection between past and present generations, and the affirmation that China has always been a great nation with a strong cultural identity. We visited the laboratories of the Shaanxi Museum and saw the painstaking conservation work to save the wall paintings. One painting takes a team of four conservators six months to complete. Of credit to the curators (and government) is a decision not to open the Emperor’s tombs themselves. These are believed to contain the most valuable remains including fabrics and possibly parchments, but they are being left sealed until such time as conservation technology advances and provides better preservation methods. In Xi’an we took part in a second conference and gave (and listened to) our same presentations again. As before there were multiple television cameras present and we had heard that our visit was widely covered on media and social media. Chinese society has widely embraced the smartphone and the whole country appears to communicate (and increasingly pay for goods) through the ‘WeChat’ app! On Friday, our final (and very different) offer was provided by the Xi’an Daming National Heritage Park. This is, as the name suggests, a city park with a heritage theme. From the air it looks like New York’s Central Park, a vast 3.5 square km open rectangular area surrounded by high rise buildings. It was the site of a former Tang Dynasty imperial palace for 220 years and is one of 33 inscribed sites forming the Spice Road serial World Heritage inscription. None of the archaeology appears to be visible and a huge gate house has been reconstructed, so in this respect the levels of integrity and authenticity are low for an inscribed World Heritage Site. To compensate for this, a wide range of interpretation methods have been employed including an Imax cinema, an open-air scale ‘model-village’ of the site, museum collections, a replica gate house and a World Heritage Centre showing other sites. There is obviously some sensitivity about the clearance of the city settlement that took place to create the park, when a significant number of people were re-housed. The on-site exhibitions contain displays of the shanty-town conditions in which the residents previously lived as part of the justification for the approach. Daming National Heritage Park must rank as one of the more unusual World Heritage Sites on the list, but as part of the Silk Road and the necessity to tell the whole story of that route it makes sense and can be seen as an essential component of the series. Even with a packed programme and privileged access, a week in China can of course only scratch the surface. We heard some fascinating presentations, with topics including the challenge of preserving the stunning ethnic rural villages in the face of mass rural de-population. There is so much to be done here and it would appear that professional cooperation between the UK and China may well be a growth industry. Having been schooled in the UK and growing up with world maps showing the UK at the world’s centre, a trip here is an eye-opening education that the East is (an historically has always been) a true world super-power. My thanks go to the British Council (Karen and Kaci) for their superb organisation and to my colleagues for their excellent company. There will be follow-up work to come, of which this report is a small part. If any WH:UK members wish to contact me to discuss any UK/China opportunities I would be more than happy to discuss this. This meeting was aimed at World Heritage practitioners and took place in Bath Cricket Club, on 8th March 2017, with an evening social meal the night before. Its focus was on the UK planning systems in respect of World Heritage Sites – seeing if there was a ‘dovetail or disconnect’. The day looked at the different systems, and discussed a very wide range of case studies in terms of impact on World Heritage Sites. The event also had a couple of workshop sessions to look at issues and solutions – and the intention is that we can use this information to start to develop a position paper for government in respect of World Heritage and the Planning system. This post gives the presentations and other information from the event. Our thanks to Lichfields, Historic England and Bath and NE Somerset Council as meeting sponsors, and to all speakers and participants for coming along and making it such an enjoyable and stimulating event.